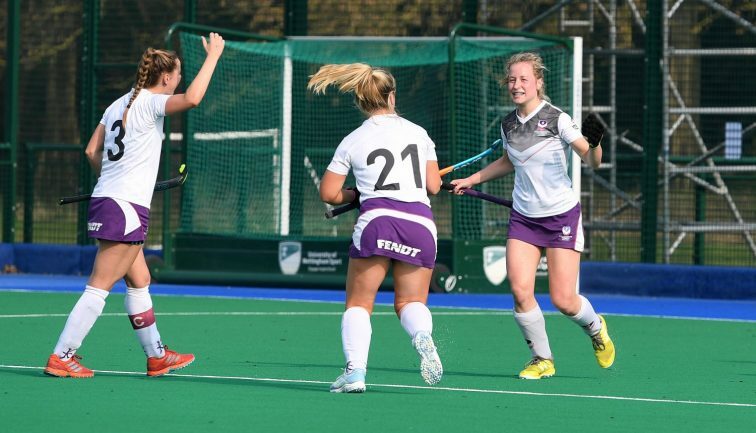 Loughborough Students boosted their hopes of promotion into the Investec Women’s Hockey League Premier Division with an emphatic 5-1 victory over Stourport on Sunday. The Conference North winners held a 2-1 lead at the break thanks to penalty corners from Hannah Grieve and Jen Park before Sarah Parkinson-Mills cut the deficit in half for Stourport. In the second half, two goals in the opening five minutes from Sophie Byrne and Lucy Millington gave Loughborough a commanding lead before another strike from Hannah Grieve sealed their win. Ninth-placed Premier Division side Slough faced Conference East winners Hampstead & Westminster, and scraped a 2-1 victory with a goal in the last minute. Amy Askew gave Conference East winners Hampstead the lead from open play early on in the second half but Slough’s Lizzy Totten soon levelled the scores six minutes later. The sides seemed destined to share the points before Philipa Newton’s penalty corner found the back of the net with a minute to spare. Slough will now face Stourport on Saturday 13th with Loughborough Students coming head to head against Hampstead & Westminster. Elsewhere, In the first round of the Investec Women’s Hockey League Division One play-offs, Olton & West Warwickshire drew first blood with a 4-0 win over Leeds. Sally Walton and Alice Conquest were in as fine goal scoring form with two goals each. The three Conference teams are chasing two final places in the new Division One set-up following a restructure for next season. Tickets for the Investec Women’s and Men’s Hockey League Finals are on sale now! Taking place at Lee Valley Hockey and Tennis Centre on Sat 13 and Sun 14 April, the country’s best teams do battle. Tickets for a single day start at just £2 for under 18s and £13 for adults. For both days it’s from £8 for under 18s and £20 adults – fantastic value to watch elite domestic players in action. Women’s Promotion Tournament: Hampstead & Westminster 1, Slough 2; Stourport 1, Loughborough Students 5. Women’s Division One Play-offs: Leeds 0, Olton & West Warwicks 4.